There’s no doubt, walking is good for your health and is one of the simplest way to stay fit. It requires no equipment (except for shoes, of course), takes minimal time, and you can do it indoors, outdoors – virtually anywhere – even if you travel a lot. Studies have reported that even short 10 minute walks, done frequently throughout out the day and consistently over a stretch of time, can dramatically reduce blood pressure and cholesterol levels. Walking also keeps your lungs and heart healthy and weight from creeping up. In fact, you may even lose a few pounds along the way! As with all fitness, there are many gadgets and accessories to keep you going. Pedometers are beneficial to help keep track of your steps and mileage. There are also many free phone applications which allow you to find new paths to explore. Some people find that signing up for community walks and races motivate them to achieve walking goals. Wearing the proper shoes with comfortable socks and taking a water bottle will make your walking journey more pleasant. It is also important to incorporate proper walking techniques -­‐ posture, arm motion, and stride. As with anything, these will improve with practice. Although walking is a fantastic first (or last) step to fitness, it may not be ideal for everyone. 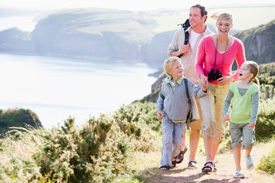 Foot and ankle problems may prevent you from participating in a walking program. As with any physical activity it is important to first check in with the Best Fremont Chiropractor at Discover Chiropractic before heading out the door. Enjoy your walk!